The Tobin Building was constructed for James J. Tobin in 1894 for use as a retail store and family residence. It replaced an earlier building on the same site owned by his uncle Michael Tobin, which was destroyed in the Great Fire of 1892. The Tobin family operated from the same Duckworth Street location for decades. The Tobin Building is one of the best examples of Second Empire style architecture that was constructed in St. John's following the 1892 Fire. The Second Empire style structure is a good example of the dwelling/business buildings built in St. John's after the Great Fire. James Tobin used the first floor to sell wines, spirits, tobacco and groceries, and used the upper levels for a home. In 1920 James' son, John M. (Jack) Tobin, became the owner of the building and sold cigars and tobacco from the ground floor store. The three generations of Tobins who lived and worked at this location made contributions to the economic, political and social life of Newfoundland. Michael served as MHA for Placentia and St. Mary's, as did his nephew James. James' son Jack was the MHA for St. John's East Extern from 1928 to 1932, and a St. John's municipal councillor from 1937 to 1941. Jack Tobin also had a lifelong involvement in sports, as a hockey player and official, as an oarsman, coxswain and coach with the annual St. John's regatta, and as secretary of the Newfoundland Hockey League for 50 years. In the 1940s he began broadcasting, his radio program, "Over the Blueline with Tobin," helping to popularize hockey in Newfoundland. Jack Tobin was posthumously inducted into the Newfoundland and Labrador Sports Hall of Fame in 1977. After Jack Tobin vacated the building, the East End Bond Store began operations there in 1928, and in 1932 it became a liquor store. The structure was vacant from 1953 until 1984. It was then used by Hayward Interiors until 1991, and then by Hutton's Music. In 1998 the building was acquired by the Pollyanna Art and Antique Gallery. The Tobin Building has a concave-curved mansard roof, decorative eaves brackets, a symmetrical façade and a traditional storefront. Despite the many changes in ownership, the building retains its original character. The bay and mansard windows remain unaltered and the structure retains the original wooden shingles and wrought iron cresting. The interior's original tin ceiling and embossed tin walls also remain intact. 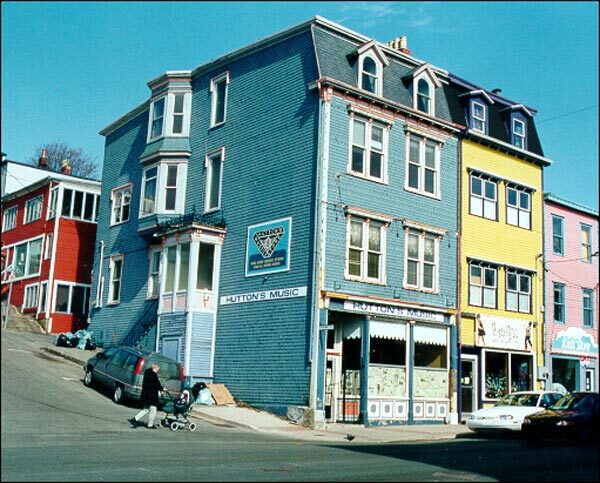 In April 1998 the Heritage Foundation of Newfoundland and Labrador designated the Tobin Building a Registered Heritage Structure, as one of the best surviving examples of post-fire commercial/residential architecture in St. John's. 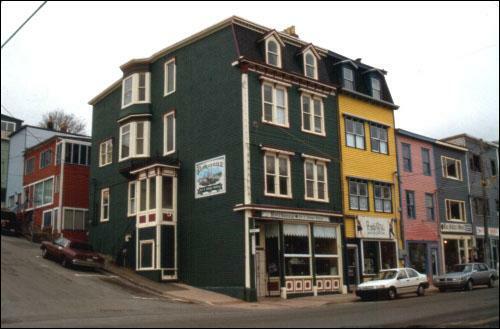 Also view the Tobin Building Registered Heritage Structure, and the Tobin Building - City of St. John's Heritage Site on the Heritage Foundation of Newfoundland and Labrador web site. The Newfoundland and Labrador Heritage Web Site has on its site only a portion of the registered heritage structures in Newfoundland and Labrador. To view a complete list or search for a particular structure visit the Heritage Foundation's Property Search page.